Start reading Hot in Hellcat Canyon: A Hellcat Canyon Novel on your Kindle in under a minute. 5.0 out of 5 starsWhat A Trip In Hellcat Canyon! Hot in Hellcat Canyon was a real treat. It was my first book by Julie Anne Long and I was pleasantly surprised. In fact, it was a real gift to have the chance to read her story. This book is all about characters: their growth, their aspiration, and their love. Is the story line is unique and full of surprises? Not really. A story between an actor and a waitress is quite common within romance stories. It could have easily become a cheesy love story and fall into a read that would have become uninteresting. Fortunately, that did not happen at all. Sure we find some “clichés“, but it is beautifully crafted and I just did not mind at all about them. I am not feeling as if I read a story, instead, I am feeling as if I was witnessing the growth of two individuals that were looking for self-love and their quest to find themselves. Julie Anne Long was able to do something very powerful just there: making it all about Britt and JT. The characters are the story line and that’s what every single book should be. Britt and JT were both on a spiritual quest of inner wisdom. As long as they are not willing to grow, there is no love possible for self or to have another one in their life. Both have a very different background, but there was a higher energy at play. To me, it was looking as fate and I am still smiling just thinking about it. What is awesome in this book is that Julie Anne Long is playing with words (or her love of words). That is amazing! Both characters are smart and I just loved how the subtleties of different words and dialogue play a huge part in this story. Having us reading between the line and feel the feeling at the same time than Britt and JT :that is what writing is all about! I don’t want to give any spoilers, but I have to tell you that JT’s toast at Felix’s wedding and the Girls night out of Britt and Casey, were delicious!!!! What is really awesome in there is also a great reminder for us all: love has a lot of ways to show up and be present enough to notice all of those little actions that are translating into love. The chemistry between Britt is JT is blowing us away and for that was a tremendous pleasure to have them interact with each other. I really hope that we will have the chance to read more about Kayla and Casey, Franco (that I really hated at first, but he found a soft spot in my heart), Trucker and even Rebecca (that I found some annoying!). I just did not want the story to end and I am already missing Hellcat Canyon. I recommend it to everyone!! It is light and deep at the same time. It is just perfect! I enjoyed this first contemporary novel by Julie Anne Long. I am a long time fan of her historical novels and I love so many of them. But contemporary romance suits her perfectly. JAL’s writing is mesmerizing with evocative imagery and a perfectly paced build-up of romantic and sexual tension. She provided me with wonderful, multi-layered characters for me to love. I enjoyed every moment in their company, loving their dialogue, thoughts and chemistry. It’s been about a year since I’ve read a romance novel but JAL lured me back to this genre with her beautiful writing. I can’t wait to read more of her work. Oh dear.....it is hard for me to write a 3-star review for Julie Ann Long. She is one of the best romance writers out there, and I cheered when I heard she was moving to contemporaries. She writes complex characters who have massive chemistry, and NO ONE can fling a brilliant turn-of-phrase the way she can. And that's part of the problem. It feels like she is working so hard to weave innuendo, double-entendre, and hyperboles into every paragraph that it becomes exhausting to read. What should be a bright and sparkly dialog between H&H gets bogged down with several paragraphs in between each line of dialog as the characters reflect on the line just spoken. They ponder, dissect, mentally review previous quips, then come out with another line of dialog. And then? Ponder, dissect, and mentally review and prepare what they are going to say next. Confession time: I only read to the 65% mark on my kindle. I just kept either putting it down or drifting off to sleep. I really applaud the brilliant historical writers like Sherry Thomas and Courtney Milan who are venturing into contemporaries....I know it can be a bumpy ride managing their fans' expectations, but this novel didn't work for me. Its hard to get swept away by the chemistry of a couple (as Long did so beautifully with The Legend of Lyon Redmond) when the forward momentum of the plot slows to a crawl as the characters constantly reflect how witty the other is. I will tune in to Long's contemporaries again...but might wait for the library copy! I'm puzzled by this book. Julie Anne Long's historical romances are extraordinarily good. Such standouts in the genre. Often because the women are smart, independent and confident in themselves. And Long doesn't rely on The Big Misunderstanding and The Jealous For No Reason Breakup. Or she didn't before. But this book is filled with all that romance silliness. And, really, another music star hiding out in a small town who falls in love with his waitress? Long seems to be setting up a few more future stories in Hellcat Canyon that, I think, promise to be more interesting and less cliched. But given Long's past work, this run-of-the-mill contemporary was a real head-scratcher. My recommendation: Skip this book altogether and wait for the next one. and sexual health before beginning that aspect of their relationship. I was surprised that this was omitted, especially in a contemporary romance. // The major annoyance that I have discovered in JAL's novels (at least in electronic format - I don't know if the print options contain this issue) is that her line editor misses grammar problems, missed words in sentences, and incorrect gender identification (i.e. identifying someone as 'her' when the story is talking about a man, and vice versa). As a reader I make these mental corrections as I read, but I do find these problems annoying). This does not stop me from reading JAL novels. I like her creativity, and the 'heart' she puts into her characters. 5.0 out of 5 starsLove This Book!!! 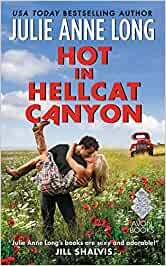 Very sleepy today because I stayed up until after 2 a.m. this morning to finish Hot in Hellcat Canyon. J.T. and Britt won my heart, along with the other assorted human peanuts That wedding toast...that thing is the stuff of legends. I wasn't sure how I'd feel about a contemporary piece from Julie Anne since I am firmly in the historical romance reader category, but, for me, this worked. Julie Garwood did something similar, moving seamlessly from one genre to the next without losing the heart of the story. I've loved Julie Anne as a writer from the moment I discovered her and herr latest did not disappoint. She has such a way with characterization and story development that it plays like a movie in your head. I could picture the little old lady with her shotgun or the extremely fluffy Phillip. It was a fast read and I'm sure I'll go back for round two, but I really enjoyed this entry. I do hope she doesn't completely abandon the historical romance side of things, but I could be very happy in a world where she regularly produced both.